Keep in mind the ingredients are a general guideline. You cannot mess this up with a little more of something here and a little bit of that there. 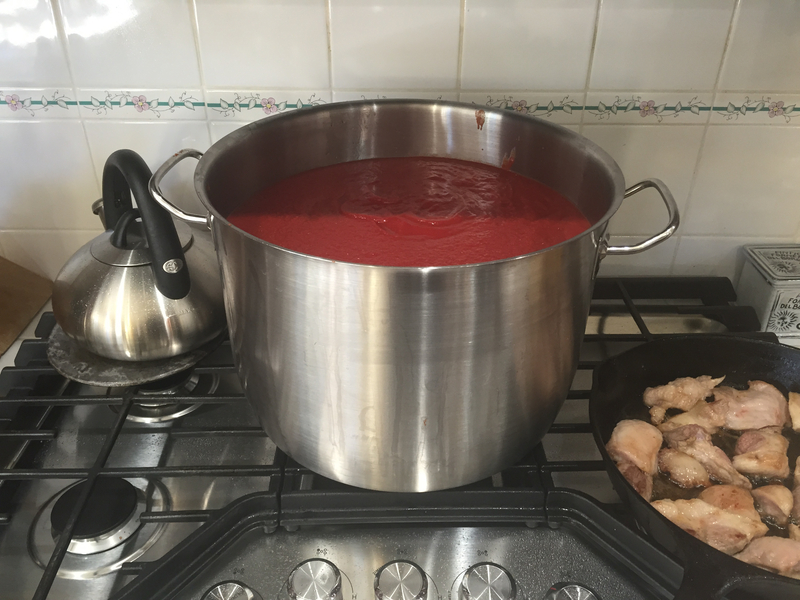 If you don’t have a large pot, use two smaller ones or halve the ingredients. 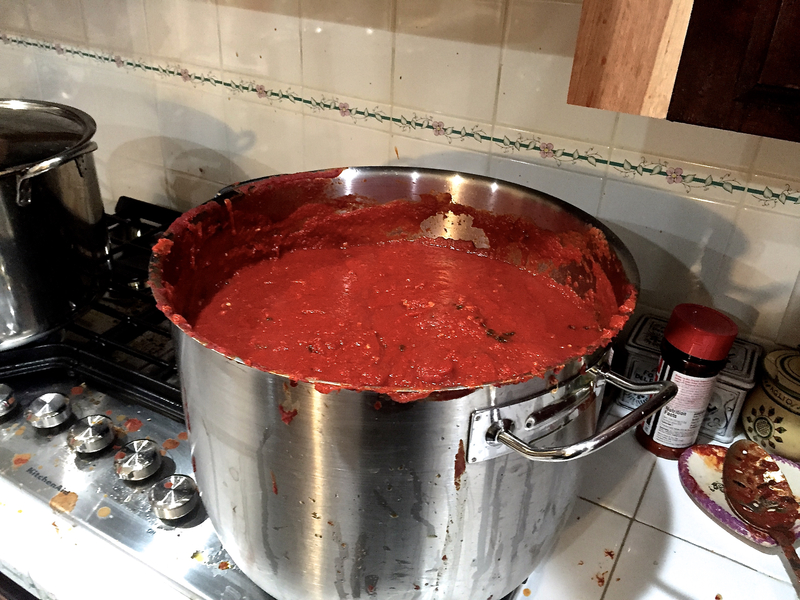 If you have a large pot, make a ton. It freezes beautifully and the more you have, the happier you will be. 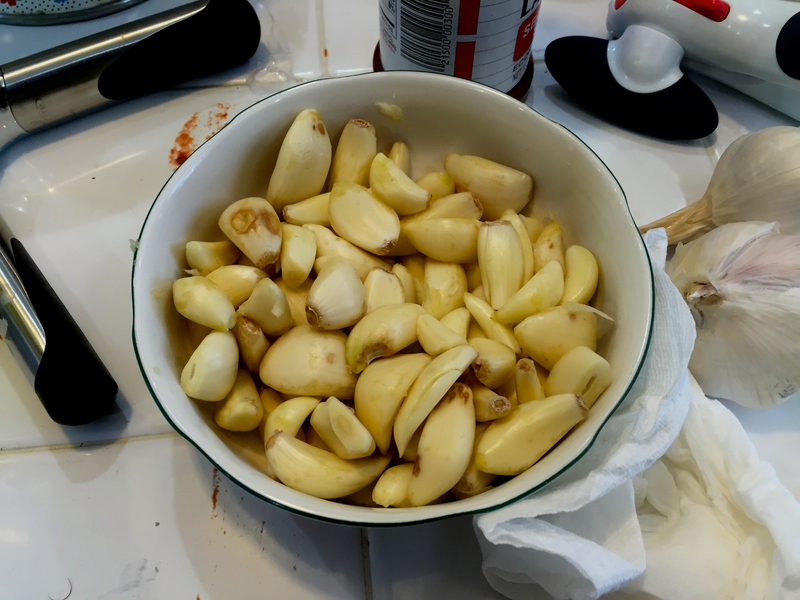 2 heads garlic peeled and minced. Yes, two full heads. Not cloves. Heads. – Season the meat with a lot of Lawry’s Seasoned Salt. Each side should have a very nice dusting. – In a large cast iron skillet or dutch oven, sear the meat over high heat in olive oil. You want a nice brown sear on every side. Do this in batches if need be. SAVE THE FAT IN THE PAN! 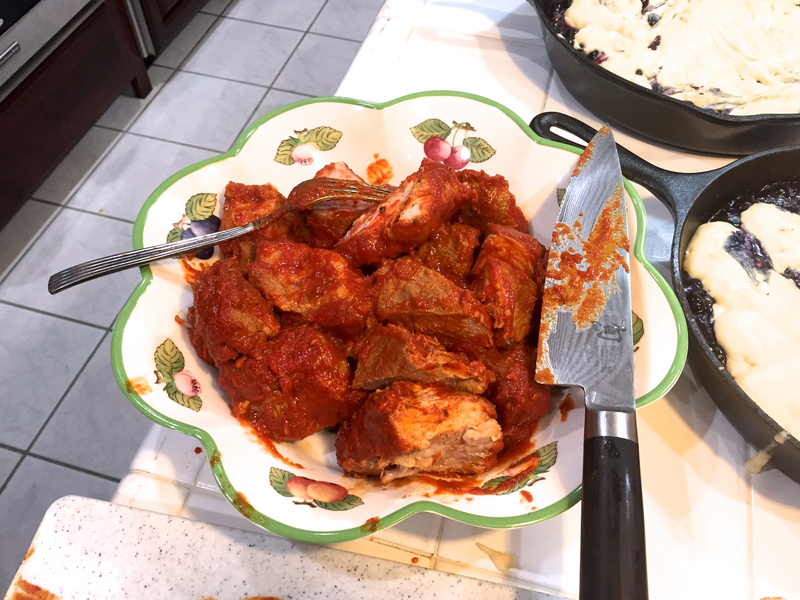 – Put the seared pieces of meat in your sauce pot, including the piece with the bone. NOTE: You can also use other meats here. Sear Italian Sausages and/or pork chops, for instance, to use in addition to the pork roast. 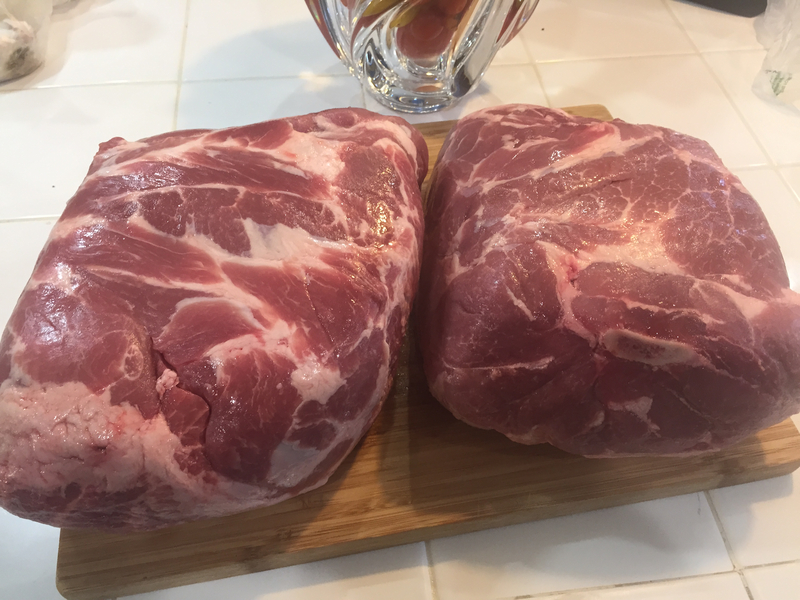 If you choose to do this, simply use a smaller pork roast. 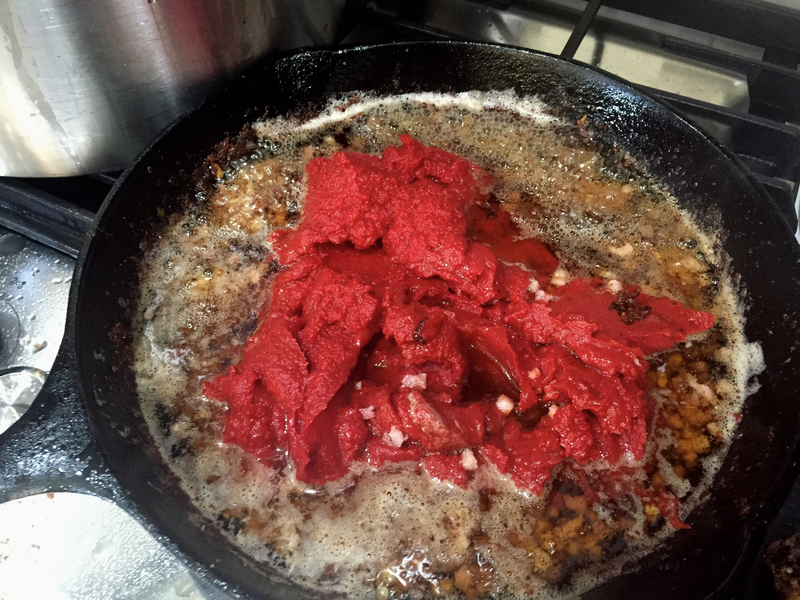 – After running the tomatoes thru the food mill, add the tomatoes to the pot with the meat. Season liberally with salt, pepper and Lawry’s seasoned salt. This means 4 or 5 good shakes of each. And this is just to start. Phyllis’s grandmother would use an entire shaker of Lawry’s! So don’t be shy. – Turn the burner on low and don’t forget to stir every five minutes or so. NOTE 2: If you are making meatballs, this is the time to do it. Fry your meatballs in the fat from searing the pork roast. 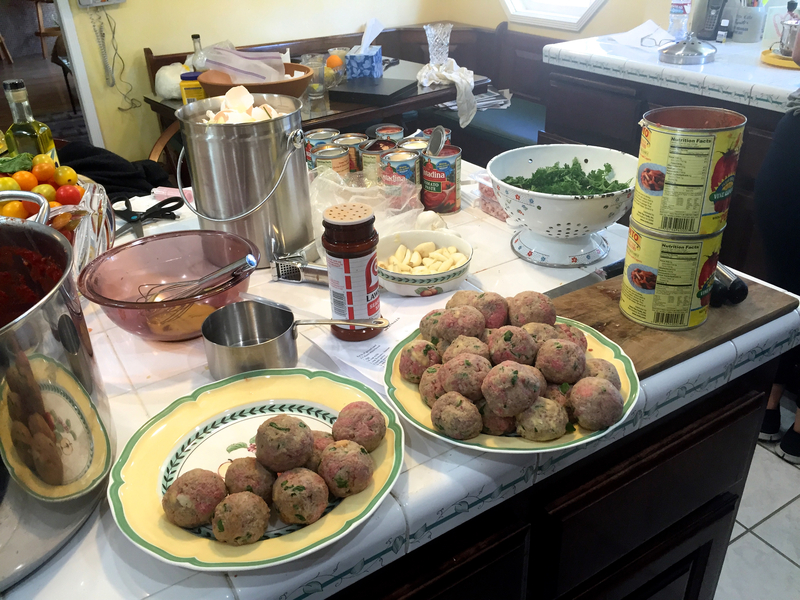 Use any meatball recipe you like but for a good meatball recipe, click over to my Aunt Barbara’s Spaghetti and Meatballs. With Sunday Gravy, cook the meatballs fully thru in the pan and do not cook in the sauce. You will need to do your meatballs in batches. 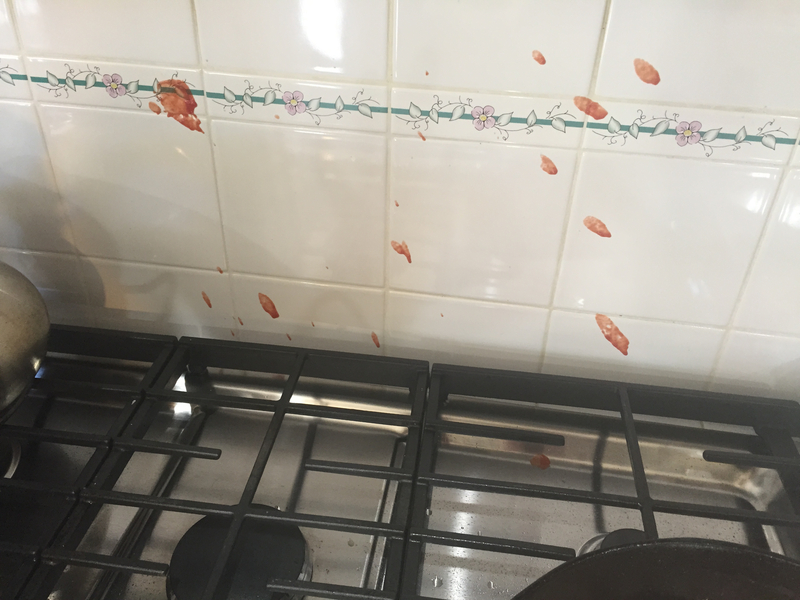 After each batch, using a slotted spoon, scoop up the dregs of the meatballs left in the pan and put into the sauce. This adds even more flavor. If you make meatballs, rewarm them in the oven about 30 minutes before you serve the sauce. 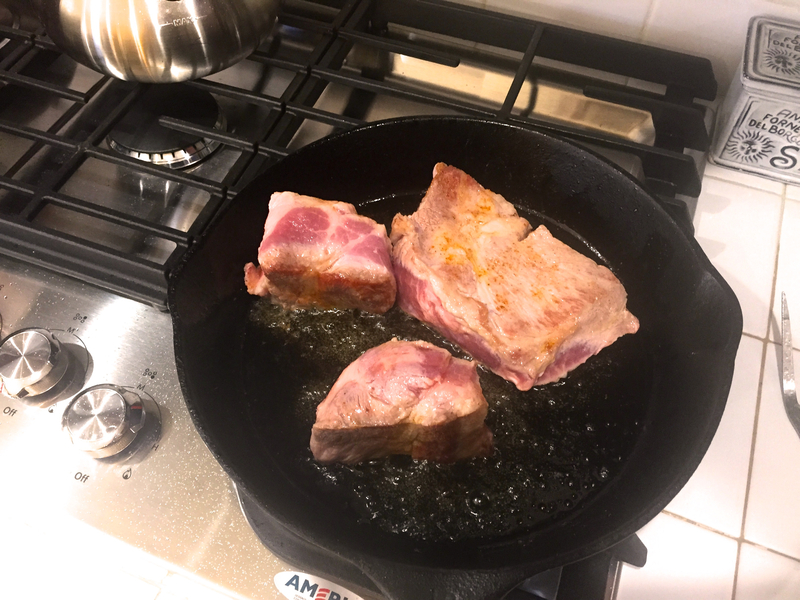 – In the pan in which you seared the meat (and perhaps made meatballs), where you have saved your fat, crisp the diced pancetta. 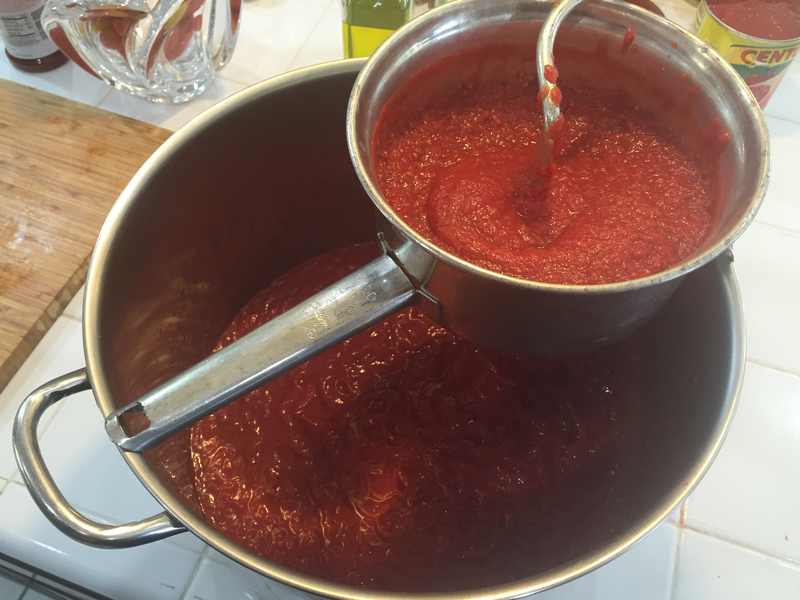 – Add the tomato paste and stir. 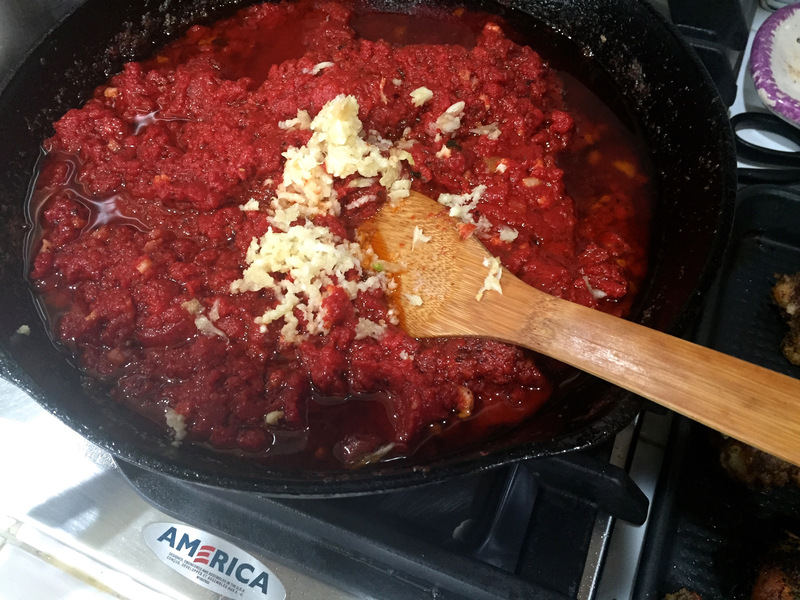 – Add an entire head of garlic, and a large handful more, minced, and a cup of fresh parsley. Season liberally with Lawry’s Seasoned Salt and crushed black pepper. Mix well. NOTE: you can add the garlic before the paste but sauce quickly and DO NOT let burn. Adding with the paste makes this easier. 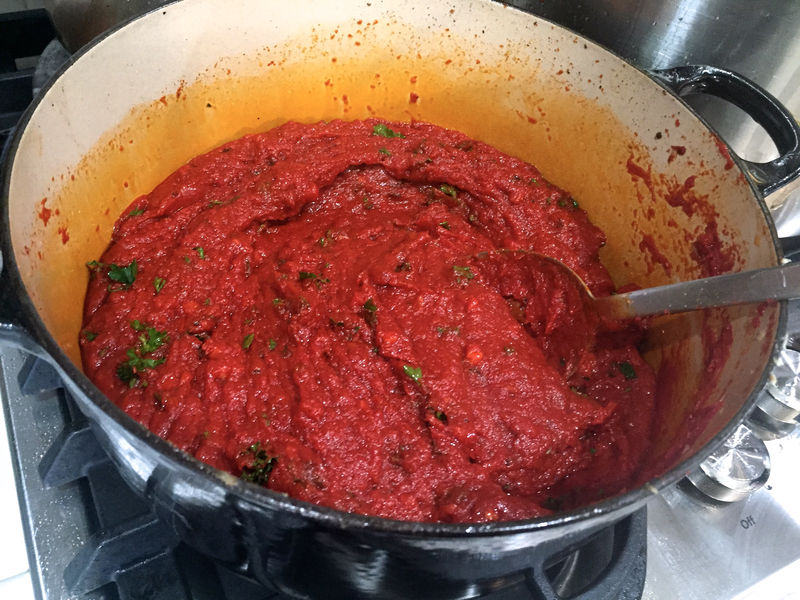 – Simmer over low heat, stirring constantly, until the pan juices, pancetta, tomato paste, garlic and parsley have combined into a deep red, glorious looking paste that is divine. 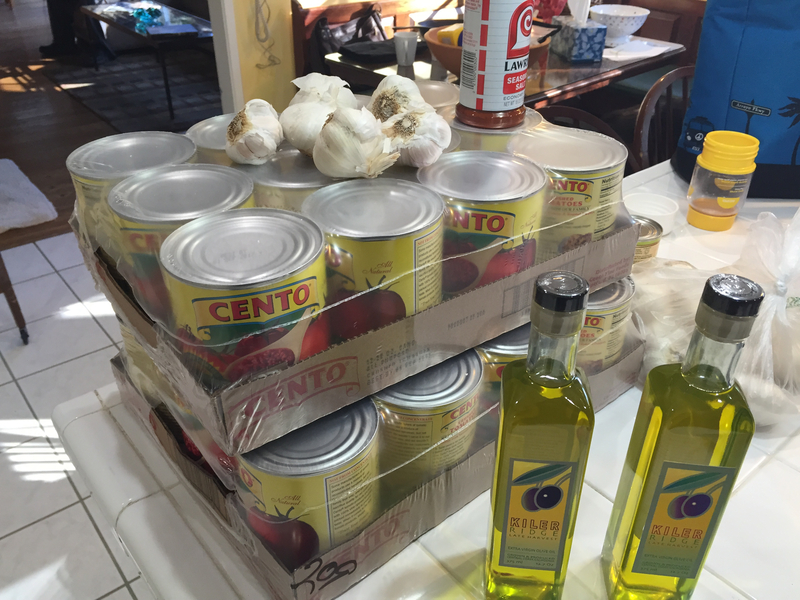 – Add this to your sauce pot. Mix well. everything is in! Now stir and cook. Don’t forget to stir. Turn the heat to medium and, stirring every few minutes or so, get the sauce to a place where it is bubbling slightly. Then turn heat back down to low and let cook for at least 5 hours, even overnight. You must stir at least every 15 minutes or so, to make sure the bottom does not burn. If this makes you nervous, you can always use a trivet. (Cooking overnight needs a burner that goes on and off or you can stick the entire pot in the oven on 300.) The longer it cooks, the better it gets. Which is why we started early in the morning. This is something you make when you can be in the kitchen or near it all day. 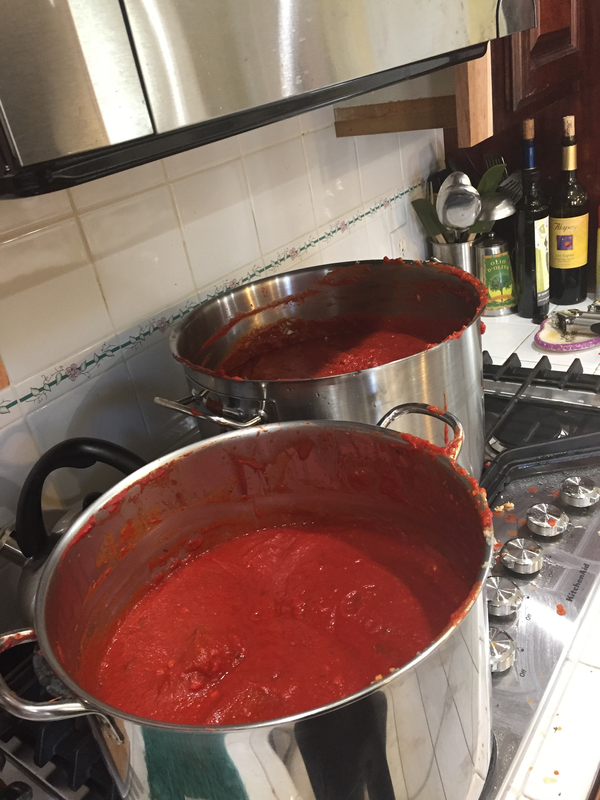 we did two pots. you WANT leftovers. Taste your sauce!! While it will get more flavorful as it cooks, I add more Lawry’s, more minced garlic, more salt and pepper, etc all afternoon as it cooks. With a large pot, as pictured, it is very difficult to over-season. Don’t take this as a challenge! But don’t be shy. Just taste! 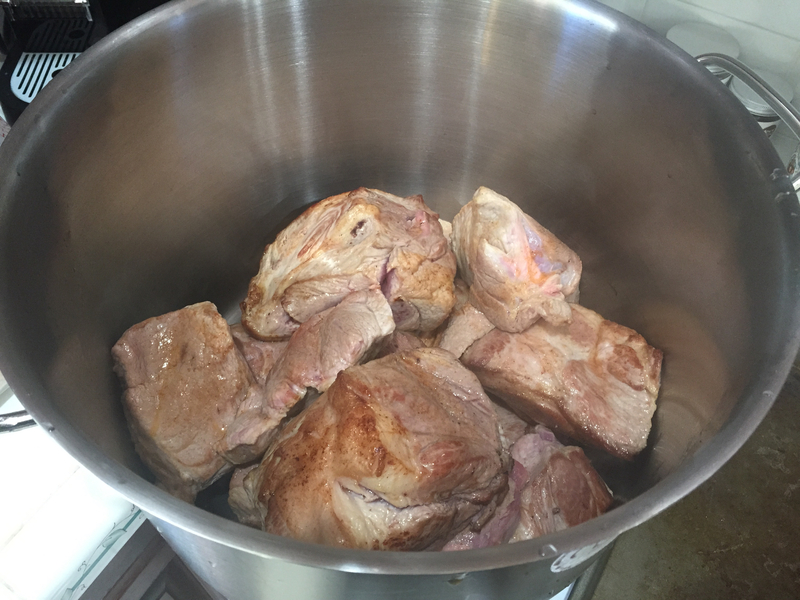 After 5 or so hours, and you are close to serving time, pull out the pieces of pork roast. (They should be tender, cooked thru and full of flavor. If not, keep cooking.) Cut the meat into whatever size you like. Phyllis likes a larger cut, which I enjoy, but you could do smaller cuts. 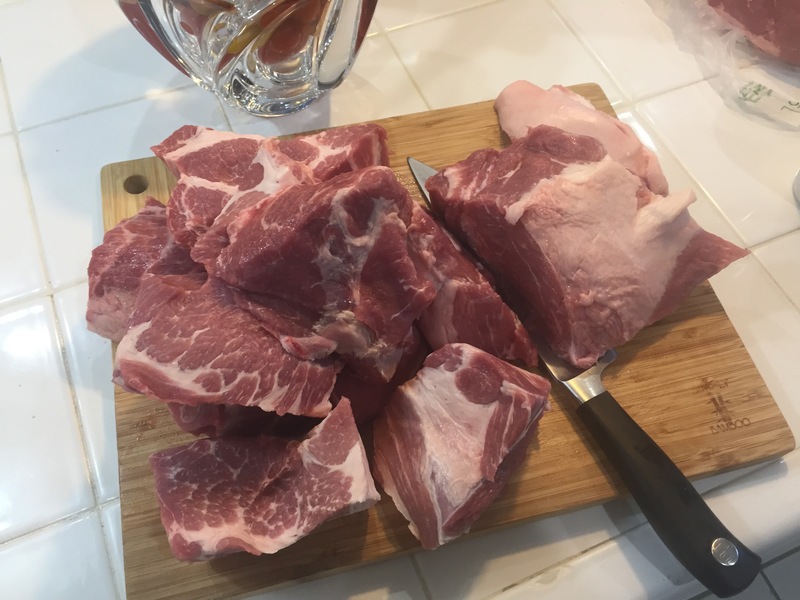 If you have italian sausages or pork chops, you can cut those in whatever style you like as well. Now you can boil your pasta. 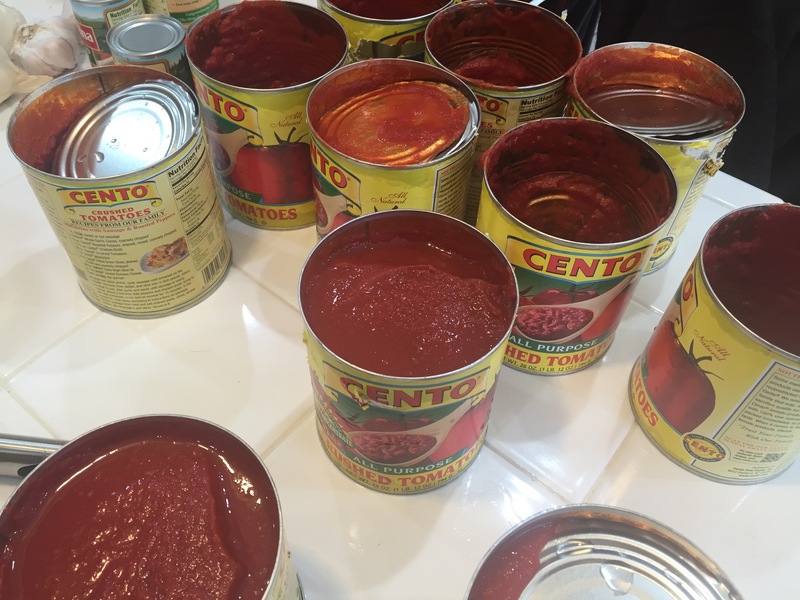 Spaghetti and penne both work great but you can use your favorite. 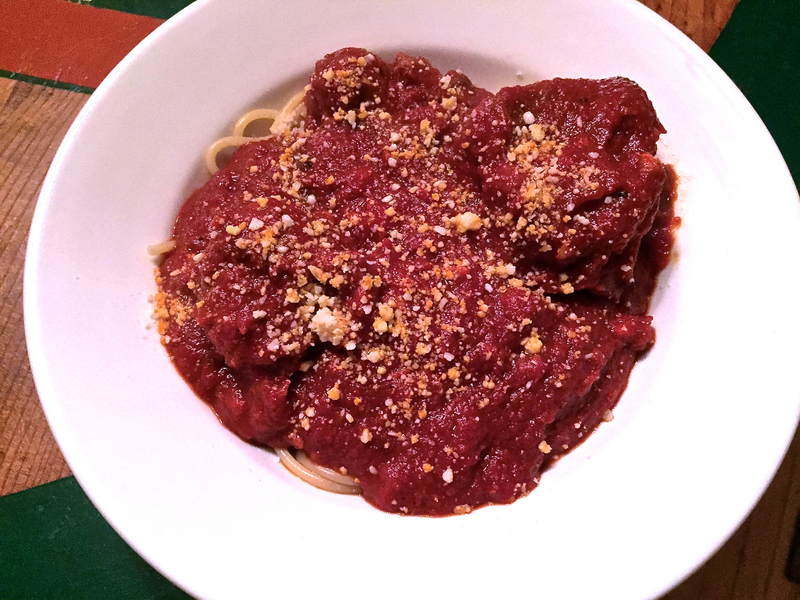 Plate your pasta, add meat and/or meatballs, ladle sauce over it and pop some red wine. Supreme happiness awaits. FINAL NOTE: There is a reason you make this on Sunday. It truly is from Heaven. I absolutely cannot wait to make this. I’m totally making the meatballs. Also, I think I may let mine cook overnight in my electric oven (it was actually my grandmom’s that she used to make her brunswick stew in!). Yum! Love all your posts and this recipe looks amazing! Give it a try Ashlyn! And thanks! !